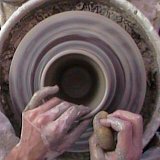 Follow this clear step by step lesson for learning pottery wheel centering. Centered clay is the foundation of pottery on the wheel. It will be well worth the time and effort it takes to learn to do this well. 1) Place a round ball of clay the size of your fist in the center of the wheel and press down on it with both hands. It should stick. That's how I do it. Lots of potters will actually throw the clay onto the wheel. Try it. It's fun. With some practice you'll be able to hit the center. Some say this is why it is called pottery wheel "throwing". Others argue that it is called "throwing" because the origin of the word "to throw" is to turn. 2) In any case, once you have it stuck to the wheel, start the wheel spinning by pressing the pedal. Practice speeding it up and slowing it down. When you're first learning pottery practice stopping the wheel several times. You'll want to know how to do this later when it's time to take the pot off the wheel! Pat the clay gently toward the center as the wheel turns. 3) Now the fun begins! Get your hands wet and place them on the clay. A note about water: While there are potters who can throw pots without using water, we humans need to get our clay wet when we throw it. This creates a thin layer of mud on the surface which keeps your hands from sticking to it. While you are throwing, water will spin off the clay and also be absorbed by your hands. Therefore, you must continuously add water to the surface of the pot. In the beginning be generous with the water. 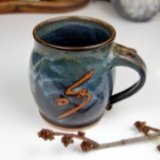 As you continue to learn pottery and improve your skills you can use less water. This is beneficial, because too much water will soak into the clay and weaken the pot. However, in the beginning more water will help you get the hang of centering without sticking to the clay. Your body should be as close to the wheel as possible. Body position is the most important thing next to having good clay. Your head should be directly over the ball of clay, elbows tucked into your ribs, hands wrapped around the clay. 4) The goal now is to center the clay making it perfectly symmetrical as it spins; with no wobbles. To do this, push the palm of your right hand against the side of the clay. Then press on top of the clay with the blade of your left hand (like you're giving it a karate chop in slow motion). Remember to re-wet your hands frequently so they don't stick to the clay. Sticking is bad. Pressing with both hands alternate the pressure, pressing harder with the left hand, then with the right hand. When you do this the clay will change in shape. This mixes and activates the clay. 5) Finally, press both hands with even pressure top and sides to center the clay. Remember correct body position, bracing your arms against your body. You can also brace your hands against each other for more support! The mound of clay should be slightly wider than it is high, like a hockey puck or better yet a thick cheeseburger, yum! 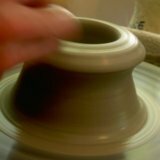 You'll know that the clay is centered when you can place your hands on the clay while the wheel is spinning and they don't wobble. 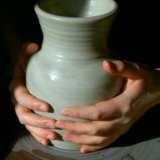 This is one of the hardest techniques to master when you are first learning pottery, so if it isn't perfect right away, that's okay. Take a deep breath, grab a snack, and try again.